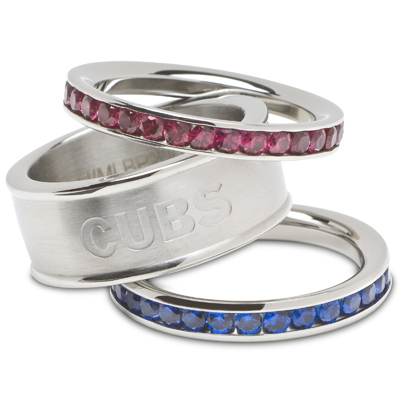 Chicago Cubs crystal team logo ring set contains stackable red and blue crystal rings and a CUBS logo ring. This official product is fully licensed and made using intricate metal molds and injected patterns for amazing detail. Rings measure approximately 5/8 inch wide when stacked together. Offered in ladies sizes 6 only. Comes with leatherette pouch for protection. Available while supplies last. Never got the ring you said couldn't get so you refunded the money. So purchased it somewhere else. Maybe I will shop another time from your website.